This was another project that we had in Margie's class. To copy an old Master! What a lot of fun I had and learned so much! Not too tacky!? I still want to fade the features on both faces a bit. Wow, Carol, this is beautifully painted! You have captured the "Monet feel" perfectly. Thanks Di - I loved painting it! 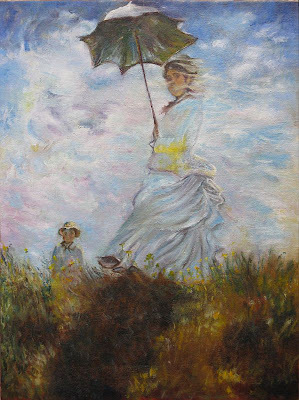 This is my favorite Monet painting, you did a wonderful job on it. I recently used a Sargeant's painting for inspiration, I didn't want to copy it exactly but it was fun to do. I'll be back. Thanks Barbara. The project was to copy as exactly as we could but of course this is impossible! Trying to get under the skin of another artist! I have often wondered just how "artistic" the people who do reproductions are. This is my favourite! Stunning work Aunty Carol.... from The Niece. Thank you Ann - yes, I enjoyed painting it and will be keeping it for me!